DARK ANGEL (a.k.a. I COME IN PEACE): Busting Up Two Genres, Baxley-Style – Schlockmania! There’s a lot of talk on the internet these days about something called “vulgar auteurism.” If you haven’t stumbled across this concept yet, it’s best described as a pretentious and over-intellectualized way of noting that there are certain directors who make hard-hitting, straightforward genre fare with skill and style. Everyone from old-schoolers like Walter Hill to upstarts like Isaac Florentine are being lumped into this group. A name that doesn’t pop up often in this group but deserves to is Craig Baxley. He is an ex-stuntman who has spent most of his career directing for television but started off with a trio of fun, flashy action flicks: Action Jackson, Dark Angel and Stone Cold. Dark Angel, known to most U.S. viewers under the alternate title I Come In Peace, is the subject of this review and it blends sci-fi and action elements in a way that makes it one of Dolph Lundgren’s most unique action-hero vehicles. The novel script, co-written by a young David Koepp under the pseudonym “Leonard Maas, Jr.,” starts with a pair of aliens arriving in Dallas and creating havoc. One (Matthias Hues) is stealing large quantities of heroin and using it to murder various earthlings for mysterious reasons. The other (Jay Bilas) is trying to hunt the first alien down, prompting explosive battles that threaten to burn the city to the ground. 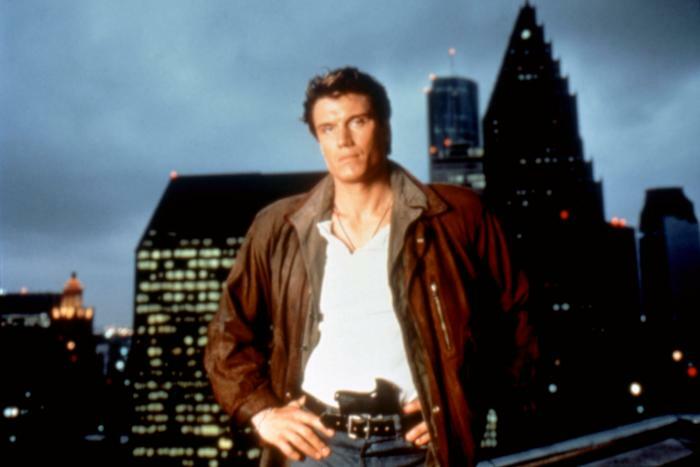 Tough-guy detective Jack Caine (Dolph Lundgren) finds himself in the orbit of the alien conflict when the bad alien steals some heroin from a gang of white-collar drug dealers he’s trying to apprehend. The FBI moves in to investigate and Caine finds himself partnered with Smith (Brian Benben), a special agent with a by-the-book mentality. The two bump heads as they try to figure out the motivation behind the alien drug/murder crime spree – and when they find that answer, it sets the stage for what might be humanity’s last stand against an alien invasion. Dark Angel the kind of gleeful, comic book action overload that you hope for from an action/sci-fi crossover like this. The script gets a lot of mileage out of familiar elements via the crossbreeding of action and sci-fi tropes and also applies a good-natured sense of humor to this mixture. It’s almost like Larry Cohen wrote a script for Joel Silver. The explanation for why the bad alien is killing people is cleve r, sealing the film’s effective blend of cop movie and sci-fi conceits, and there’s a novel weapon used to slash human throats that will amuse genre fans. 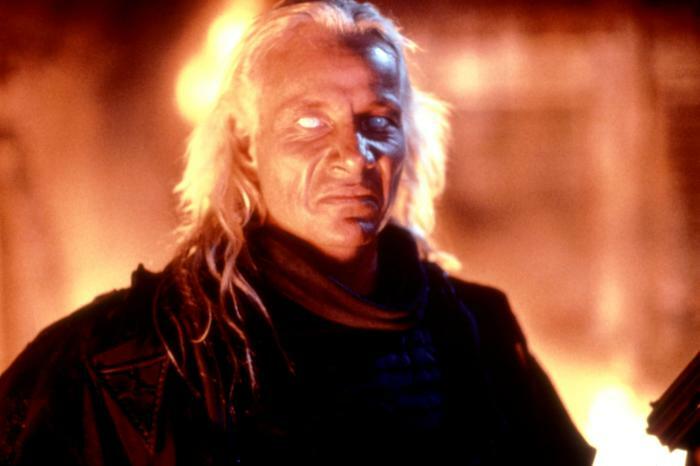 However, what puts Dark Angel over the top is Baxley’s vigorous direction. His pacing is aggressive in a good way and he uses his specialized stunt knowledge to create a string of eye-popping action sequences: highlights include a parking garage showdown between the aliens that involves one alien leaping across car hoods as they detonate underneath him and a factory-set finale that packs more explosions into one reel than your average war movie. 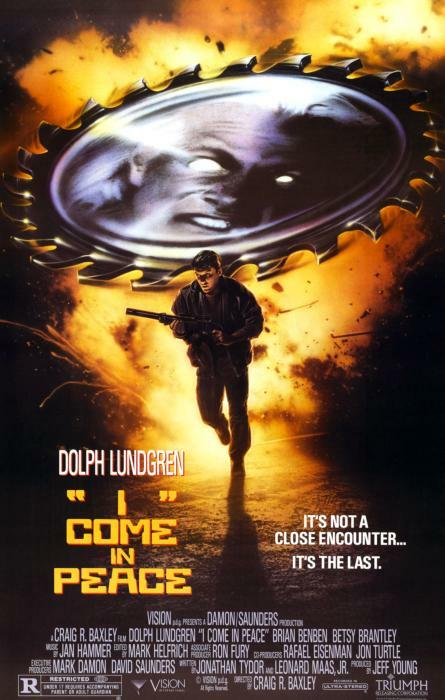 Like the best action directors, Baxley also enjoys his actors and uses them well: Lundgren delivers a nicely underplayed variation on the cynical cop hero under Baxley’s direction while Benben sets the tone for the film’s sarcastic sense of humor with his sly asides to the action. Betsy Brantley also delivers a spirited performance as Caine’s love interest (in an interesting wrinkle, she’s also the city’s coroner). Finally, Lundgren gets a worthy foe in Hues, who uses his gigantic frame and icy Nordic looks to create a genuinely imposing villain. 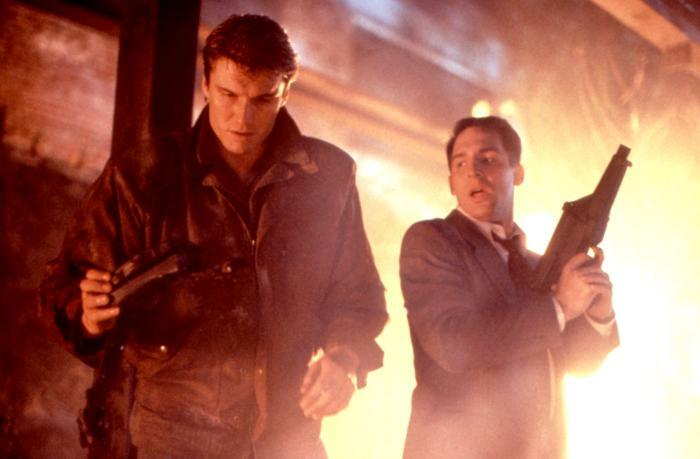 Simply put, Dark Angel is guaranteed to hit the sweet spot for fans of old-school action fare: it’s engaging, full of thrills and said thrills are all the sweeter because they were done with real practical effects. Whether you’re a proponent of “vulgar auteurism” or just a good, old-fashioned fan of genre flicks, there is plenty of explosive fun to be had here.